What you can see above is the final result, complete with stamping. 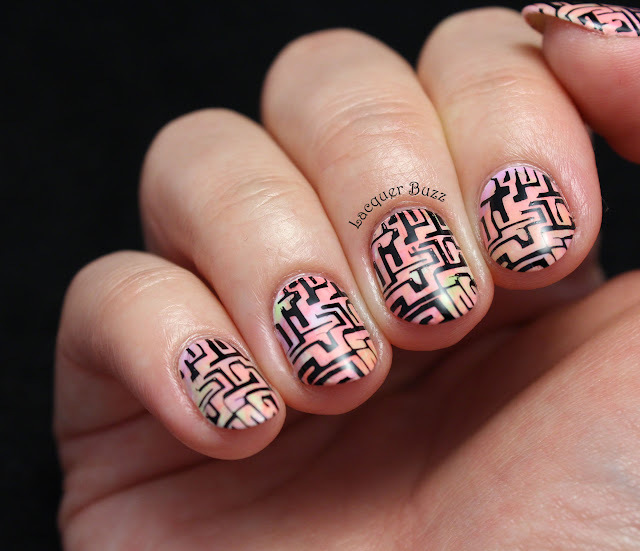 I used plate 07 Labyrinth from Moyra and black stamping polish from the Born Pretty Store to stamp the design on top of the neon base. 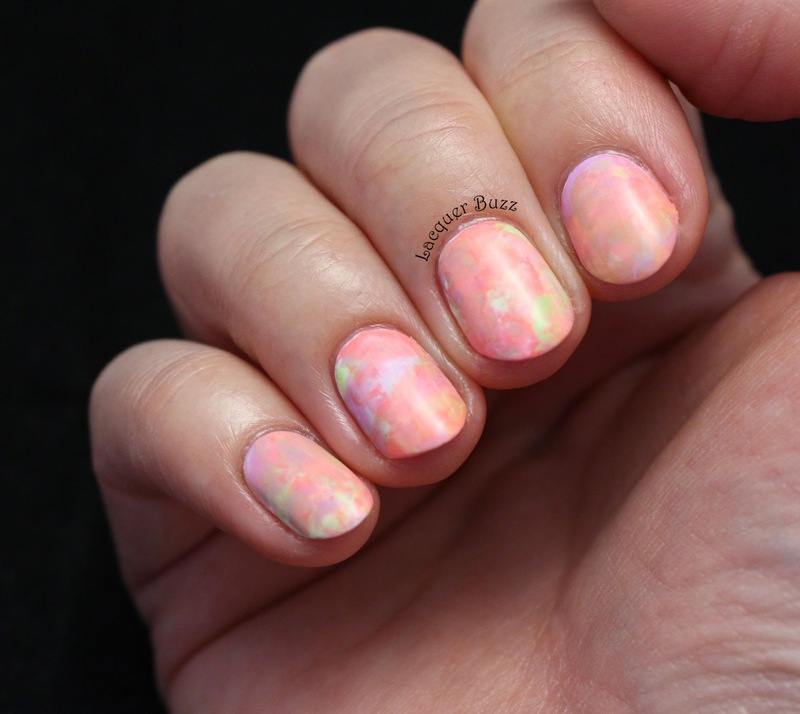 The base was created using a stamper and what some call the squishy or smoosh method. Let's take a look! I'm in love with how this came out. The pictures aren't that true to reality because the colors don't pop as much as they did in real life. I only used polishes from China Glaze: Lotus Begin (purple), Feel the Breeze (pink), Petal to the Metal (coral) and Be More Pacific (green). I just placed the colors randomly on a stamper and then stamped them on the nail over a white polish (Barry M Cotton). It's so easy and if you use liquid latex there's very little cleanup needed. So nice! 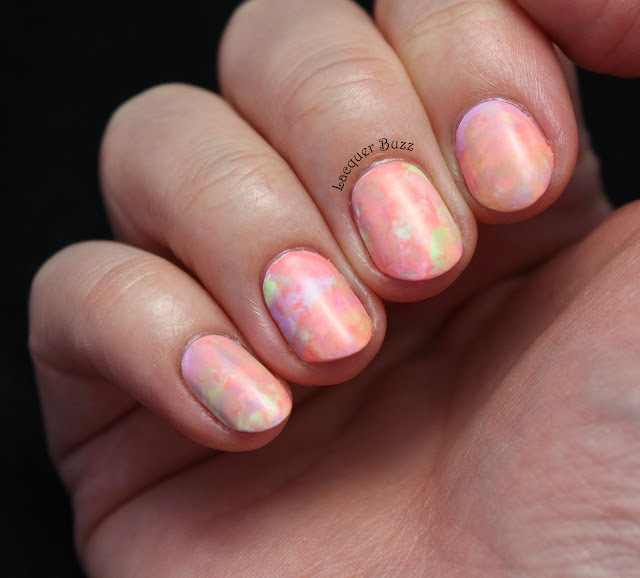 I wore this manicure (complete with stamping) for a full week. That rarely happens to me but this wore so well that I didn't get any chips until I took it off. I suspect that the fact that my nails were so short had a lot to do with the wear time. Let me know what you thing about this manicure and have an amazing weekend!